We Were Woodwards: Happy 97th Birthday Grandpa Vic! Happy 97th Birthday Grandpa Vic! Grandpa is pictured in the upper right had corner of this picture. He has his hand in his pocket. 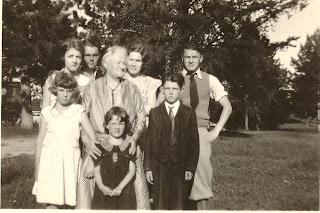 He's pictured with his Grandma, Carrie and alot of other cousins (probably). This is probably a picture of Carrie and her Grandkids. Victor is one of the oldest. He was very handsome and he got married to our Grandma MaryAnn Krantz at age 22. He looks like he is in his late teens or early 20's here so not too long from now he'd be married. Today is March 3 and it's Grandpa Vic's 97th birthday. Grandpa Vic was born as Victor Vivian Woodward on March 3, 1912 in Cass Lake, Minnesota. He died on April 3, 1963.